NEW Fish Hunter Marabou SPEY Blood Quills are part of our regular inventory at the Caddis Fly Shop and will ship promptly with NO Sales TAX; plus Free shipping on most Domestic USA orders. Fish Hunter Spey Plume Marabou is the highest quality and consistency of any we have found in the last year. Our most discriminating customers have told us that Fish Hunter Marabou is a superior product. We tested their assertuib and agree. Consequently, we are now offering a variety of Fish Hunter fly tying products in our Eugene Oregon Shop and though our Internet Catalog. Why purchase your Fish Hunter materials from the Caddis Fly Shop? The quality of Fish Hunter fly tying feathers is uniquely outstanding and we ship with NO TAX and FREE SHIPPING on most domestic USA orders. How are Fish Hunter Marabou Spey Plumes different? The length is about 5 � 6 inches. longer than standard blood quills, and the plumes have barbules that are a little longer as well. Amazing and consistent quality: We sorted many bags of Fish Hunter and other brands of spey marabou plumes. Our tests confirmed that Fish Hunter Marabou is typically over 90% in the very good to excellent quality. We have come to depend on Fish Hunter Marabou without exception. The Quantity per package? Approximately � ounce per bag. How many colors do we stock? 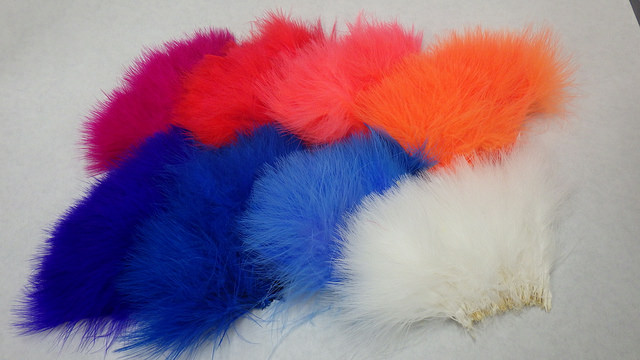 We have ordered in over a dozen colors of the Fish Hunter Spey Marabou plumes. Let us know if you wish a color we have not listed and we will let you know if and how soon we could provide it to you.